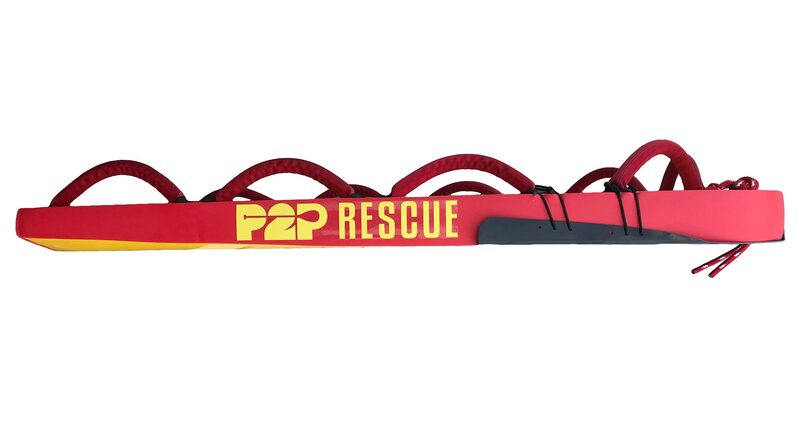 The P2P ® JET SKI RESCUE SLED is our latest innovation in rescue board design. At the request of lifeguard and ocean rescue agencies we have incorporated our unique and durable board construction into a jet ski rescue sled. 10 Quick grab handles constructed using durable tubular webbing and a solid 1” rubber core. Handles secured into deck of board using stainless steel screws with epoxy/resin imbedded Chinook plastic inserts. The P2P ® RESPONDER is our most recent innovation, built for use either behind a personal watercraft, or detached for stranded victim rescues in swift or flood waters. We gathered input from lifeguards in Hawaii, swift water rescuers in North Carolina and firemen in Florida when designing every aspect of the RESPONDER. 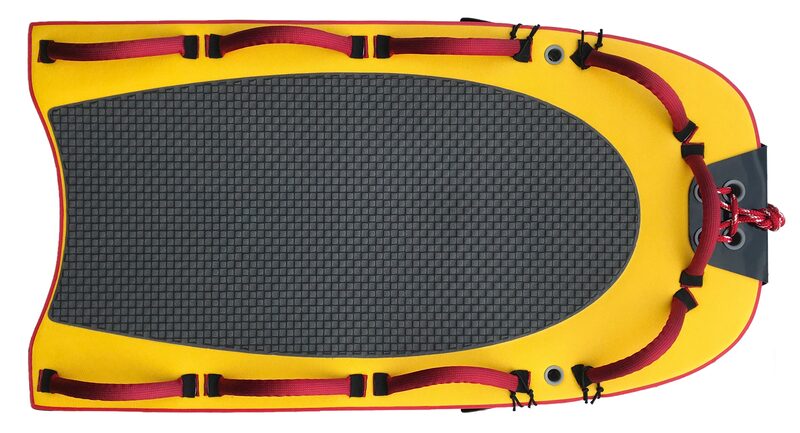 This board provides the strength, width and durability to facilitate multiple victims rescues or even in-water resuscitation. Overall length of 7′, including full traction pad coverage providing ample space for a victim, rescuer, and first responder equipment. Custom-engineered jet ski connection with port and starboard bungees for stabilizing and control. Jet ski connection can be removed and with rocker throughout the board it can alsovbe used in flat, flooded or swift water rescue scenarios. Heavyweight handles along the lengths of the board for multiple quick-grab and tie-down options. Handles constructed from solid rubber core and webbing for strength and durability, raised for ample room to wrap ones arms under and thru for securing a victim. Lightweight at only 40 lbs. including all handles, jet ski connections and rope. Durable construction with an EPS foam core using innovative Innegra™ fiberglass, allowing for repairs while on duty and the board to never lose service.